Ash-sharq is a journal devoted to short articles on the archaeology, history and society of the Ancient Near East. It is published twice a year. The principal language of the publication is English; there will be some provision for papers in the languages currently spoken in the Middle East (Arabic, Hebrew, Kurde, Persian, Turkish), accompanied by an English abstract of 500 words. All volumes from 2017 are currently available at the following prices for libraries and institutional customers. Discounts available for private customers, please see individual issues for reduced prices. Table of contents for 2017-2018 available here. Please note: Print volumes supplied as individual issues (two per volume). Online edition presents one PDF file per volume (containing two issues). Submissions are welcome from academics and researchers at all levels. The principal language of the publication is English; there will be some provision for papers in the languages currently spoken in the Middle East (Arabic, Hebrew, Kurde, Persian, Turkish), accompanied by an English abstract of 500 words. Ash-sharq: Subscription Portal for Online Access Archaeological, Historical and Societal Studies edited by Laura Battini (editor-in-chief). ISBN 2513-8529-PORTAL. 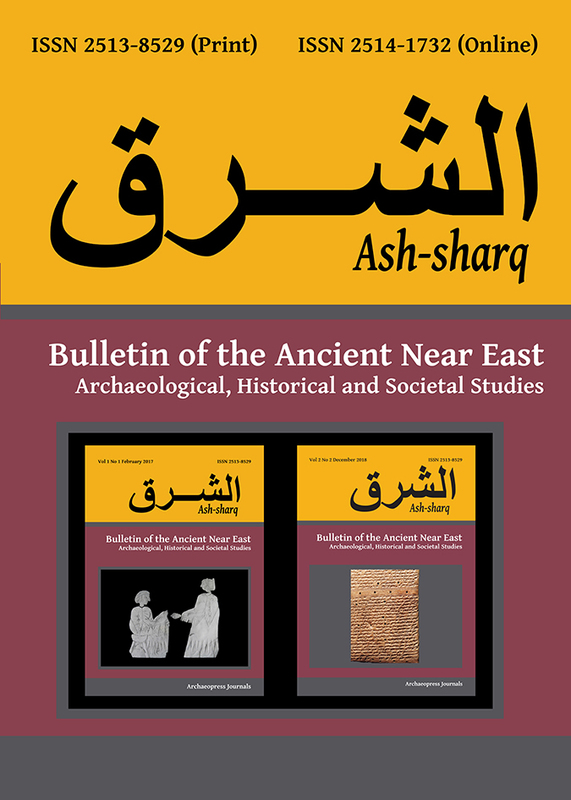 Welcome to the online portal for access to volumes Ash-sharq - Bulletin of the Ancient Near East: Archaeological, Historical and Societal Studies. Please note this page is for existing institutional subscribers only. To start a new institutional subscription or for all private subscriptions please follow this link. Ash-sharq is a journal devoted to short articles on the archaeology, history and society of the Ancient Near East. It is published twice a year. The editorial board is headed by Laura Battini (Paris, UMR 7192-Collège de France, France). ). Further details and information on the editorial and advisory board is available here.